Asparagus spoils more quickly than other veggies and should be eaten within 48 hours of purchase. White asparagus is grown underground. Thin asparagus does not need to be peeled at the base of the stem. Some folks may notice, ahem, their pee smells different after eating asparagus. There are no known health risks associated with this phenomenon. One of the benefits of following a plant-based diet is your tastes adjust and you develop a greater appreciation for healthy foods like asparagus. The salad makes a great side dish or a tasty and filling meal on it’s own. 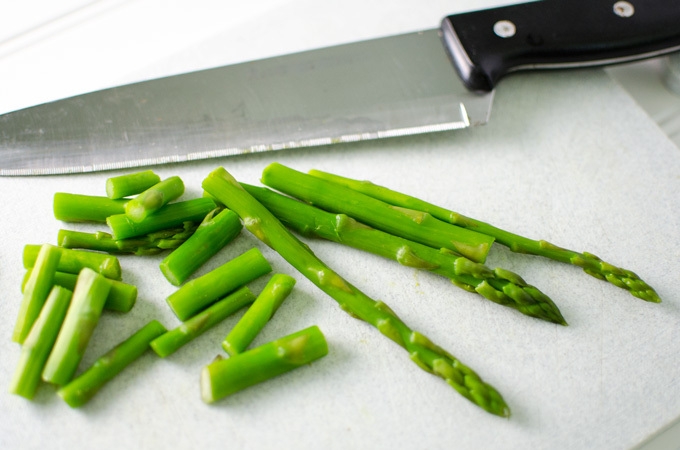 Immediately rinse steamed asparagus with cool water. 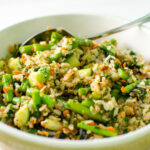 Chop asparagus into 1-2 inch pieces and add to a large mixing bowl. Add carrots to a food processor fitted with an S blade and pulse until finely chopped. Scrape carrots into the mixing bowl. Add onion to food processor, pulse to finely chop and add to mixing bowl. Wash dark leafy greens, pat dry, strip stems and discard. Add leaves to food processor, pulse to finely chop and add to mixing bowl. Stir to mix ingredients. When rice is done, add to mixing bowl (1/3 at a time) and stir to mix thoroughly. Add teriyaki and stir until mixed. Tear nori sheets into strips, and then tear a couple of strips into 1-inch pieces and sprinkle over ingredients in mixing bowl. Stir to mix and then repeat until all of the nori has been added and mixed. Add almonds and stir to mix. 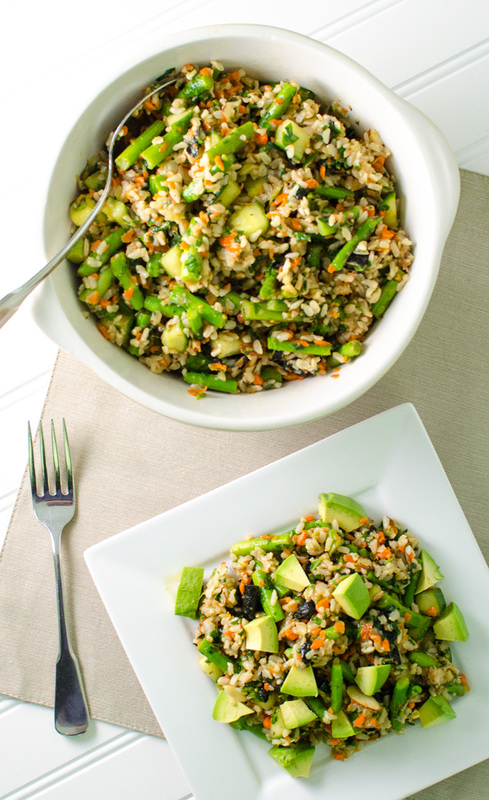 Serve salad cool or at room temperature topped with fresh diced avocado. 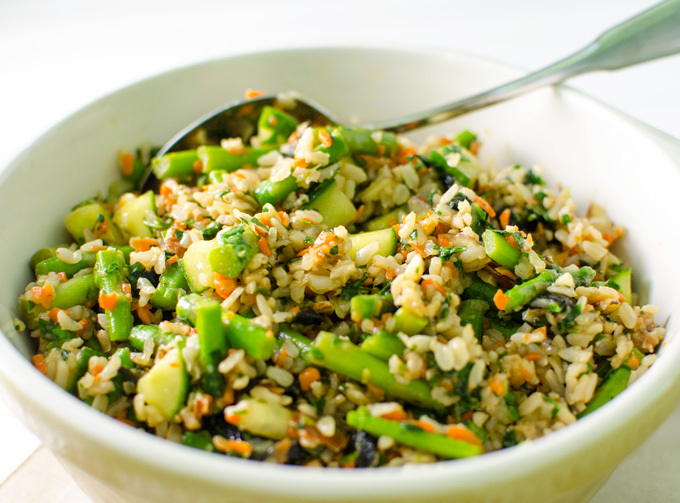 Cooking the rice and asparagus ahead of time significantly reduces the amount of time it takes to prepare this salad. It could be ready in less than 15 minutes! I’ve made similar sushi salads with sweet potatoes and some of my other favorite ingredients. What’s your favorite kind of veggie sushi? Can it be made into a salad? My wife knows I do not like asparagus but since I’m part of the taste-testing team, I tried it. I enjoyed the bowl as a side for my dinner. Another triumph for Veggie Primer. Pulling in non-vegans and giving them something healthy to eat. I use Adobe Illustrator to create my vertical pins for Pinterest. I like to use Illustrator instead of Photoshop because it’s easier to work with type in a vector graphic program. This was brilliant…deconstructed sushi!! We made with quinoa and added some sauteed mushrooms. Really delicious…thanks! Made this last night and it was amazing. Thank you so much! !